There’s a brand-new way to experience outdoor adventures in Hamilton County. K-Trails Equestrian Adventures is a premiere riding experience located just east of Cicero and north of Noblesville in beautiful Strawtown Koteewi Park.Offering family trails rides, guided trail rides and sunset rides, K-Trails gives families a chance to interact with animals and nature in a unique way. My family recently had the chance to visit their newly opened facilities and take a family trail ride. I lost count after the fifth time my son proclaimed his new love of horseback riding so I can assure you that if you have a young adventurer in your house, this will be a hit! K-Trails website contains information about all their current offerings and it’s easy to sign up for a time using their interactive calendar and registration. I was even able to save time by electronically completing the waivers and paperwork at home. For the safety of everyone, trail riders must be seven years or older, however pony rides will be available for younger children. There’s no need to have previous experience with riding. This was my son’s first experience with horseback riding and our wrangler was patient and kind in helping him get comfortable with his horse. Both my husband and I were matched with horses that were a great fit for our experience level and we felt very comfortable the entire ride. You’ll want to make sure you’ve got sunglasses and sunscreen as most of the trails are in full sun. You’re welcome to bring your camera or phone as you ride, but water bottles, bags and other items should be left in your car or at the front desk to ensure that nothing disrupts your ride. K-Trails will provide helmets for each rider and I would suggest long pants and shoes you don’t mind getting muddy, as the pasture area can be very messy. Rides range from 45 minutes to two and a half hours depending on the experience. This doesn’t include instructions and equipment setup so plan at an hour and a half for the shortest experience. Riders also need to arrive about 15 minutes before their scheduled ride to make sure paperwork is complete. There is ample parking and restroom facilities at the stables – located on the south side of the park. Follow the directions from your confirmation email to make sure you enter the park in the correct location. Your wrangler or guide will be able to give you lots of information about the park as you ride through. We rode on an early spring afternoon so the trails weren’t very crowded but I expect in the summer you’ll see joggers and bikers enjoying the miles of trails that make up the 800+ acres of the park. The setting in gorgeous and peaceful and feels miles and miles from the hustle and bustle of the city. The folks at K-Trails have even more offerings planned in the future and will include scout experiences, family Chuck Wagon dinners and Saturdays at the Barn, where future equestrian enthusiasts can spend time learning about the art of riding and horse care. If you’re a seasoned rider and have your own horse, boarding stalls are available for guests who are camping at the adjacent White River Campground. 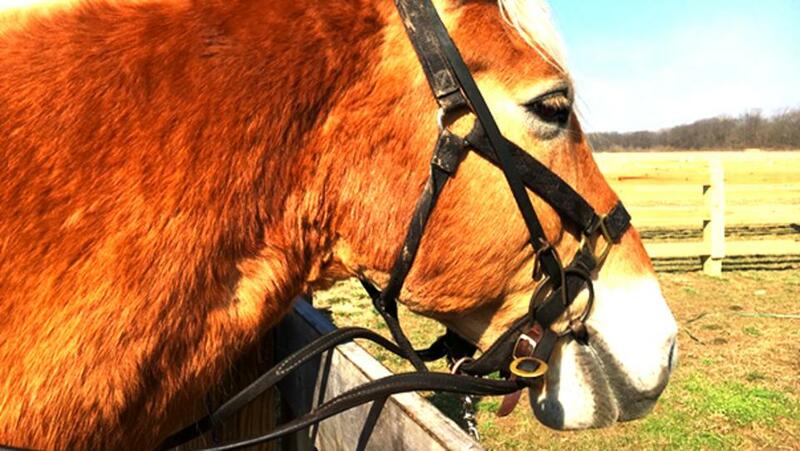 So, whether you love riding or have never experienced a trail ride, I suggest you giddy-up (I couldn’t resist one good horse pun) on over to Strawtown Koteewi Park to check out K-Trails. It’s the perfect new outdoor opportunity to experience Hamilton County’s natural beauty.